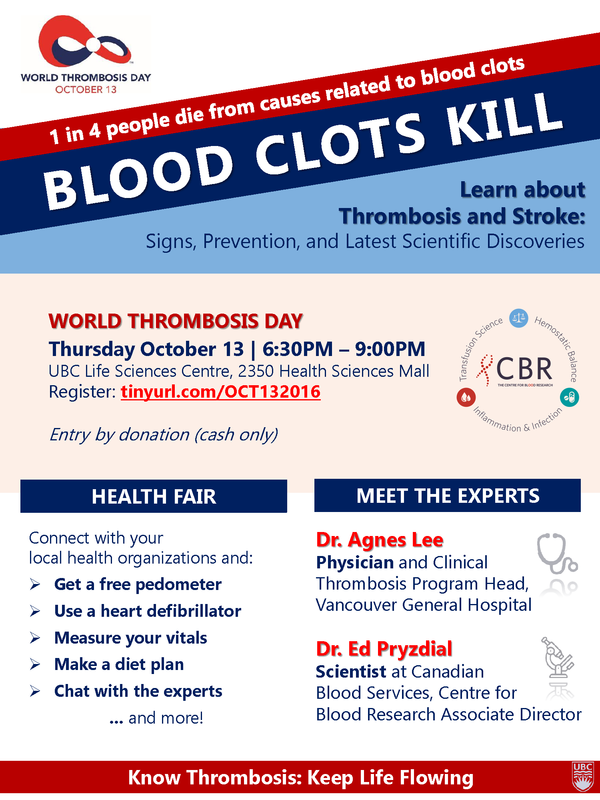 The Centre for Blood Research has partnered up with with World Thrombosis Day and organizations across the globe to raise awareness on Thrombosis and Stroke. Thrombosis (blood clot) is the formation of potentially deadly blood clots in the artery (arterial thrombosis) or vein (venous thrombosis). Once formed, a clot can slow or block normal blood flow, and even break loose and travel to an organ. A clot that travels to the circulation is called an embolism. Thrombosis is the often preventable underlying pathology of heart attack, thromboembolic stroke, and venous thromboembolism (VTE), the top three cardiovascular killers. Thrombosis is preventable and treatable!